Found 3 blog entries for March 2008. Friday, March 14th, 2008 at 12:12pm. The Hayman Company announced that it has acquired Irving commercial real estate, as well as a property in San Antonio. Union Bower Business Park is a303, 000 square foot facility with multiple tenants. It is ideal for distribution facilities with multiple loading capabilities and numerous truck courts. This multi-tenant property includes office space, some of which is presently vacant. Tuesday, March 11th, 2008 at 11:55am. If you've been in Valley Ranch, you have probably seen these new townhomes for sale. They are beautiful, 3-story brick/stone homes that sit like a beacon atop a great hill. The Manors at Valley Ranch is built by a smaller, custom home builder; therefore avoiding the tract home, cookie cutter feel. Wednesday, March 5th, 2008 at 11:45am. 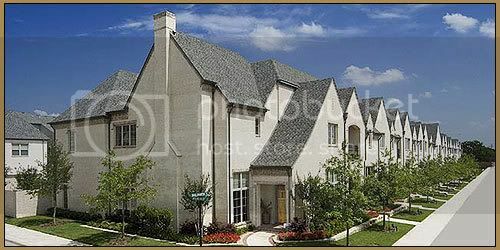 The Villas of Lake Vista is European-style townhome community located in Coppell, TX. A development of Wellington Manor Homes, a Hawkins - Welwood company, these homes offer a unique style for the area and have beautiful accents and detail around every corner. D Magazine gives Hawkins - Welwood Best Builder Award for 2008 and the Home Builders Association of Dallas (HBA) awarded them Best Townhome Community in August 2007.